21 Grams is a 2003 American crime drama film directed by Alejandro González Iñárritu from a screenplay by Guillermo Arriaga. The story was co-written by González Iñárritu and Arriaga. The film stars Sean Penn, Naomi Watts, Charlotte Gainsbourg, Danny Huston and Benicio Del Toro. The second part of Arriaga's and González Iñárritu's Trilogy of Death, preceded by Amores perros (2000) and followed by Babel (2006), 21 Grams interweaves several plot lines in a nonlinear arrangement. 21 Grams revolves around the consequences of a tragic automobile accident. Penn plays a critically ill mathematician, Watts plays a grief-stricken mother, and Del Toro plays a born-again Christian ex-convict whose faith is sorely tested in the aftermath of the accident. The three main characters each have "past", "present" and "future" story threads, which are shown as non-linear fragments that punctuate elements of the overall story, all imminently coming toward each other and coalescing as the story progresses. Jack Jordan is a former convict who is using his new-found religious faith to recover from drug addiction and alcoholism. Paul Rivers is a mathematics professor with a dedicated wife, Mary Rivers, and a fatal heart condition. Unless he receives a new heart from an organ donor, he will not live longer than one month. Paul's wife wants him to donate his sperm so she can have his baby even if he dies. Cristina Peck is a recovering drug addict and now lives a normal suburban life with a supportive husband and two children. She is a loving mother and active swimmer who has left her days of drugs and booze behind. These three separate stories/characters become tied together one evening when Jack kills Cristina's husband and children in a hit-and-run accident. Her husband's heart is donated to Paul, who begins his recovery. Cristina is devastated by the loss and returns to drugs and alcohol. Paul is eager to begin normal life again, but he hesitantly agrees to his wife's idea of surgery and artificial insemination as a last-ditch effort to get pregnant. During consultations with a doctor before the surgery, Paul learns that his wife had undergone an abortion after they had separated in the past. Angered, Paul ends the relationship. He becomes very inquisitive about whose heart he has. He learns from a private detective that the heart belonged to Cristina's husband and begins to follow the widowed Cristina around town. Jack is stricken with guilt following the accident and starts using drugs again. Despite his wife's protests to keep quiet and conceal his guilt, Jack tells her that his "duty is to God" and turns himself in. While incarcerated, he claims that God had betrayed him, loses his will to live and attempts suicide. He is released after Cristina declines to press charges, as she realizes that putting Jack in prison will not bring her family back. When Jack is released, he is unable to reincorporate himself into normal family life, and instead leaves home to live as a transient, working in manual labor. Paul finds an opportunity to meet Cristina and eventually reveals how the two of them are connected. She is initially furious and forces him out, but quickly reconsiders. Desperately needing one another, they continue their relationship. Though Paul has a new heart, his body is rejecting the transplant and his outlook is grim. As Cristina begins to dwell more on her changed life and the death of her girls, she becomes obsessed with exacting revenge on Jack. She goads Paul into agreeing to murder him. Paul meets with the private detective who originally found Cristina for him. He tells Paul that Jack is living in a motel and sells Paul a gun. Paul and Cristina check into the motel where Jack is staying. When Jack is walking alone, Paul grabs him and leads him out into a clearing at gunpoint with the intention of killing him. However, Paul is unable to kill Jack, who himself is confused, shaking and pleading during the event. Paul tells Jack to "just disappear," then returns to the motel, lying to Cristina about Jack's death. Later that night, while they are sleeping, Paul and Cristina are awakened by a noise outside their door. It's Jack, who, still consumed by guilt, orders Paul to kill him and end his misery. There is a struggle, and Cristina blind-sides Jack and begins to beat him with a wooden lamp. Paul collapses, gets hold of the gun, and shoots himself. Jack and Cristina rush Paul to the hospital. Jack tells the police that he was the one who shot Paul, but is released when his story cannot be confirmed. Paul dies, and the conflict between Cristina and Jack remains unresolved (they meet in the waiting room after Paul's death; if they converse, it is not shown). When she offers to donate blood for Paul in the hospital, Cristina learns that she is pregnant. After Paul's death, Cristina is seen tentatively preparing for the new child in one of her daughter's bedrooms, which she had previously been unable to enter after her daughter's death. Jack is shown returning to his family. The title refers to an experiment in 1907 which attempted to show scientific proof of the existence of the soul by recording a loss of body weight (said to represent the departure of the soul) immediately following death. 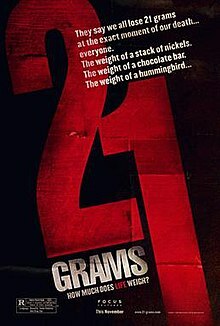 Referred to as the 21 grams experiment as one subject lost "three-fourths of an ounce" (21.3 grams), the experiment is regarded by the scientific community as flawed and unreliable, though it has been credited with popularizing the concept that the soul weighs 21 grams. 80% of the critics surveyed by Rotten Tomatoes gave the film positive reviews, based on 183 reviews with an average rating of 7.5/10. The critical consensus states that "Alejandro González Iñárritu deftly weaves an uncommonly structured narrative with panache in 21 Grams, a stylish, haunting drama full of fine performances." Roger Ebert, for example, questioned the use of non-linear narrative, but praised the acting and said of the film overall: "It grips us, moves us, astonishes us." Elvis Mitchell also praised the acting and called the film "an extraordinarily satisfying vision" that "may well be the crowning work of this year." The film was a commercial success, garnering a worldwide gross of approximately $60 million after being made for an estimated $20 million. Naomi Watts and Benicio del Toro received several awards and nominations for their performances in the film, including Academy Awards and Screen Actors Guild Awards nominations in the categories of Best Actress and Best Supporting Actor. ^ "21 GRAMS (15)". British Board of Film Classification. November 18, 2003. Retrieved November 16, 2014. ^ a b c "21 Grams (2003)". Box Office Mojo. IMDb. Retrieved December 17, 2010. ^ "nthposition.com". www.nthposition.com. Retrieved July 26, 2017. ^ "Weight of the Soul". Snopes.com. Retrieved February 23, 2015. ^ "21 Grams (2003)". Rotten Tomatoes. Flixter. Retrieved April 25, 2014. ^ Ebert, Roger. "21 Grams review". Chicago Sun-Times. RogerEbert.com. Retrieved December 17, 2010. ^ (October 18, 2003). "Movie Review 21 Grams (2003)". The New York Times. Retrieved August 20, 2013. ^ "FFCC Award Winners". FloridaFilmCriticsCircle.com. Archived from the original on December 9, 2011. Retrieved June 4, 2011. This page was last edited on 24 February 2019, at 08:46 (UTC).